THE OFFICIAL SITE OF SOUTH OF THE BORDER. Pedro has a whole fiesta of fun activities for the young and young-at-heart! Our newest attraction is our Reptile Lagoon. It’s the largest indoor reptile exhibit in the U.S. and is air conditioned for your comfort. We have all kinds of snakes, crocodiles, alligators and turtles. You can read more about the different types on our Blog. Our friendly trained staff will be happy to answer all your questions, and teach you about the animals in our collection. Not only will you and your children be learning about reptiles, you will be helping them too. Part of every admission goes to the Crocodile Conservation Institute, which helps save crocodiles and their habitat around the world. The Reptile Lagoon is available to rent for birthday parties, meetings and other special events. And of course, it wouldn’t be South of the Border if we didn’t have a gift shop with lots of cool, funky items to help you remember your visit to the Reptile Lagoon. Pedroland Park boasts an assortment of fun rides just for the kids. Some of these include the Carousel, SRV Reality Ride (a simulator), Mini-Himalaya, Ferris Wheel, Train, Quadzilla, Antique Cars, Red Baron Airplanes, and Bumper Cars. Pedroland Park also features 2 Championship miniature golf courses – 18 holes each! If you prefer something a little tamer, Pedro’s video game arcade will surely keep you entertained. The El Toro Arcade is located at the base of the Sombrero Tower, with others throughout the complex. 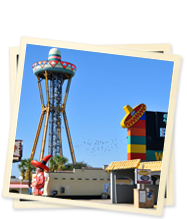 The Sombrero Observation Tower is over 200 feet high and its glass elevator gives riders a full view of South of the Border’s grounds as it glides to the top. The newly painted and renovated tower gives visitors a full 360 degree view of the Carolina countryside. At night, its neon lights glow and twinkle making it look like a sombrero shaped spacecraft! For even more about the Sombrero Tower, check out our Blog post. Instagram – Check us out! ©2013 South Of The Border. All Rights Reserved.